The first of the five volumes of Panchatantra. Long ago, in a village in south India, there lived a merchant named Vardhaman. One day, while resting on his bed, he realized that money was the axis of the world, and that he would become powerful on gaining more money. He convinced himself that even enemies seek the friendship of a rich man. Money makes the old become young, while even the young become old if they do not have wealth. He logically thought that business was one of the six ways that make man amass wealth. Once a merchant began building a temple in his garden. There were many masons and carpenters employed by the merchant to do so, who would take time-off for lunch every day. One day, when the workers had left for their usual lunch break, a group of monkeys approached the building site and began playing with the instruments used. One of the monkeys fancied on a wedge that was fixed into a partly sawed log of wood to prevent it from closing up. A hungry jackal ended up at an abandoned battlefield while in search of food. Here, he encountered loud and strange sounds and he thought "I must run away from this place before the person who is making such sounds gets me". But soonafter, he realized, "It will not be proper for me to run away without knowing the cause of the sounds. Whether it is fear, or happiness, one must know the reason behind it, otherwise there will be no regret. Let me look for the source of these scary noises". Once, there lived a wealthy merchant named Dantila, in the city of Vardhaman. He organized a lavish reception for his wedding ceremony which was attended by the king and the queen, apart from the ministers and all the rich and influential people of the city. Gorambha, a lowly sweeper in the royal household, was also present in the reception. Gorambha was occupying a seat that was reserved for the nobles of the king. When Dantila noticed this, he was angered, and he ordered his servants to throw him out of his house. 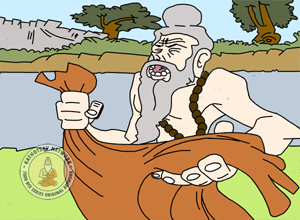 There lived a sage named Deva Sharma in a monastry situated far from human habitation, who has amassed a lot of wealth by selling clothes gifted to him by his well-wishers and disciples. Since, he did not trust anyone, guarding the accumulated wealth became a burden for him, and he carried his bag full of money with him wherever he went. A thief named Ashadhabhooti, noticed Deva Sharma carrying his bag at all times and obvously assumed it to contain valuables. He began to plan on how he could steal the bag away from him. A lion named Bhasuraka ruled the jungle, indiscriminately killing all other animals. All the other animals, who were victims, decided to meet the lion one day in a delegation. "Oh, lord," they said, "why do you kill so many of us every day, when you need only one for your food? Let us come to an understanding. Now onwards, there is no need for you to hunt. We will send an animal every day to you. This way, you will be spared the trouble of hunting and us our lives." There once lived a bug named Mandavisarpini in the king's ornamental bed. It made itself a small home in the folds of milk-white linen. One day, it observed a flea enter the king's bedroom, and instructed the flea to leave before somebody noticed it, for it was a wrong place. Once, there lived a jackal named Chandaraka in the deep forest. One day, he wandered into a nearby village in search of food, but was chased and attacked by a group of mongrels instead. In an attempt to flee from the mongrels, it hid in the house of a washerman. He sat into a vat filled of indigo used for bleaching clothes. After some time, when he exited the house he appeared like a blue animal. Even the mongrels dispersed, unable to recognize him. 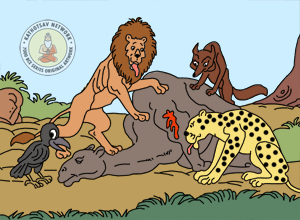 Once there lived a lion named Madotkata who was served by a leopard, a jackal and a crow. One day they sighted a camel named Kradanaka who had lost his way and wandered into the jungle. Unable to recognize this unusual animal, the lion summoned his assistants to find out the details of this animal. There once lived a pair of pheasants near a sea. They spent their time singing and dancing happily on the branches of the trees. One day, the female pheasant asked her husband to look for a safe place for her to lay eggs. The male pheasant replied, "My dear, the sea-side is the most enchanting place for you to lay eggs". 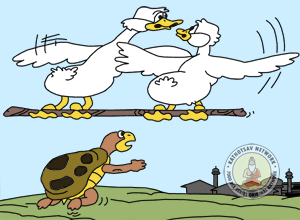 Once there lived a turtle named Kambugriva in a pond, who had two swans as good friends named Sankat and Vikat. They would often meet on the pond-side and discuss legends of yore, and disperse at sunset. One particular year, there were no rains and the level of water in the pond started declining. 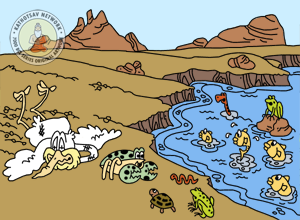 Once there lived three fishes named Anagatavidhata, Pratyutpannamati and Yadbhavishya in a pond. One day, some fishermen were passing by the pond. They discussed amongst themselves, "Hey, this is the first time we are seeing this pond and it seems to be full of fishes. Let us come here to catch fishes tomorrow." Once there live a sparrow couple in their nest on a banyan tree, where the female laid eggs. 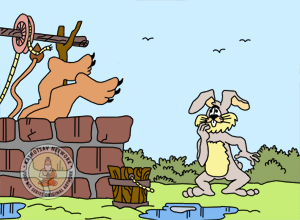 One afternoon, unable to bear the heat, a wild elephant went berserk and snapped a big branch of that tree - breaking the sparrow's nest and eggs. 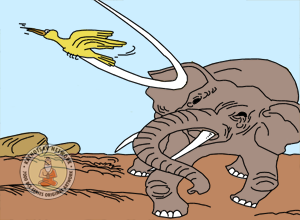 The sparrows flew to escape the fury of the elephant. When they realized their eggs destroyed, they were pained and the female sparrow began to weep for her eggs. The wolf expected the jackal to convince the lion of his innocence. But the jackal was cunning and said, "I had warned you against eating the meat. Why do you expect me to help you now?" Realizing that there was danger, the wolf fled as fast as possible to save himself. 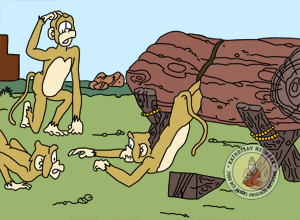 Once there lived a group of monkeys in a mountain slope. During the winter, they were unable to stand the severe cold and heavy rains. Mistaking red berries for embers of fire, they collected some of the wild red berries and gathered around to blow air. There happily lived a pair of sparrows on the branch of a big tree. During the winter, gusts of cold winds and heavy rains made it unbearable. One day, a monkey drenched in the rain came to the tree seeking cover. 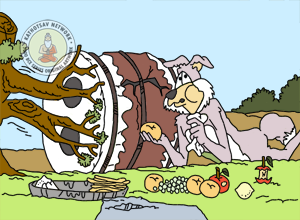 There were two friends named Dharmabuddhi and Papabuddhi in a village in the northern India. One day, Papabuddhi thought to himself, "I am poor and lack the worldly wisdom. If I can persuade Dharmabuddhi to travel to far off lands with me, we can earn a lot of money through his business skills. Later, I can deprive him of the money earned to live happily". In the jungle, there lived a few cranes that had nested in a big banyan tree. In the hollow of the same tree, lived a cobra. The cobra used to fee on the eggs and young-born cranes. When the mother saw this, she began to weep. Moved at the sight of the crane in her sorrow, a nearby crab asked her the reason. 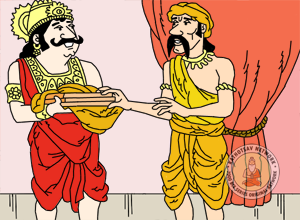 There was once a son of a rich merchant named Jeernadhana who had lost all his wealth. He thought to himself that he should not live here as a poor man since people who respected him once, would now look down upon him. He decided to go abroad to seek his fortunes. For some money for his travels, he mortgaged a 1000-pound iron balance that his ancestors had left behind, with a local merchant. Once, a king had a pet monkey. The pet monkey served the king in whatever ways he could and had all the freedom in the royal household. One hot day, the monkey was fanning and guarding the king while he was asleep. He then noticed a fly on the king's chest. Every time the monkey shooed it away, the fly would go away for the moment, only to return back on the king's chest. 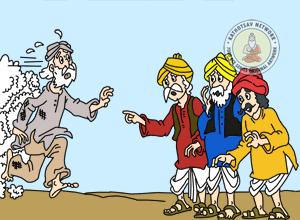 Once there was a thief in a big town, who observed four Brahmins from another city selling a variety of goods in his town. He thought of befriending them through sweet words to deprive them of the money they were earning. He became useful to them in whatever ways he could. These words of Damanaka relieved Pingalaka of his troubled mind. The lion king was pleased with Damanaka's advice, and re-appointed him as his minister, to continue his rule of the forest as ever. 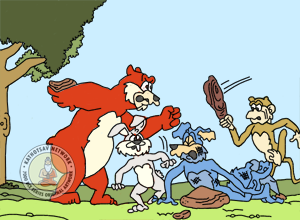 Thus ends the first part of the Panchatantra.